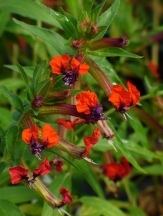 Attract loads of butterflies to your garden with our excellent selection of nectar producing butterfly plants. From Porterweed, Butterfly Bushes, Butterfly Weed, Lantana, Vitex, to Pentas as well as many other beautiful and free flowering nectar producing plants that are sure to bring these fluttering wonders into your garden from spring to fall. 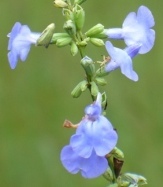 Azure blue, 4-6'' spikes are held above the Anise scented foliage in summer.An upright growing clump forming native perennial. This popular herb was used as a healing herb by American Indians and is great for making jellies, potpourris, and teas. An excellent plant for attracting bees, butterflies, and hummingbirds. Item# 3022. Frilly, rounded clusters of dainty white tubular flowers are borne in summer atop sturdy stems and are an excellent nectar source for a variety of smaller pollinators and garden beneficials. 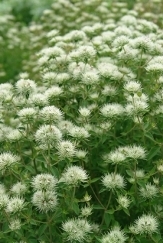 Savanna or Appalachian Mountainmint has nicely fragrant, medium green foliage and is considered to be one of the better Mountainmints for garden settings as it is not as prone to spreading by rhizomes. Item# 10765. Apricot Sunrise produces an endless display of soft orange to soft golden yellow tubular flowers in spikes from summer and into fall well above the fragrant foliage. 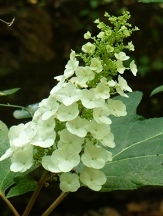 An excellent choice for hummingbird and butterfly gardens with a soft airy texture. Provide a full sun or near full sun location with average moist but well-drained soils. Item# 10210. 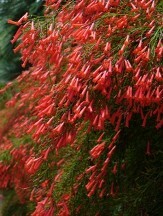 Spikes of dark orange tubular flowers are borne nearly continuously from spring to frost atop fragrant blue-gray foliage. 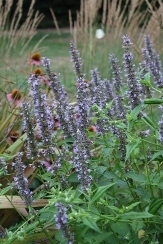 Arizona™ Sandstone Agastache is a compact hybrid of our native perennial Agastache selected for its short, compact, freely branching, and exceptionally free flowering habit. A delight for hummingbirds and butterflies, the Arizona™ Sandstone Agastache are perfectly sized to create colorful containers or to add color in garden. These plants have plenty of flower power and will revel in the heat and sun of summer producing a nearly endless display of color. Item# 10788. Spikes of sunny yellow tubular flowers are borne nearly continuously from spring to frost atop fragrant blue-gray foliage. Arizona™ Sun Agastache is a compact hybrid of our native perennial Agastache selected for its short, compact, freely branching, and exceptionally free flowering habit. A delight for hummingbirds and butterflies, the Arizona™ Sun Agastache are perfectly sized to create colorful containers or to add color in garden. These plants have plenty of flower power and will revel in the heat and sun of summer producing a nearly endless display of color. Item# 10789. From nearly red buds open large rich pink flowers that lighten toward the center of the flower and have a yellow-orange blotch. 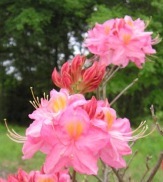 A wonderful pink Aromi hybrid deciduous azalea, Country Cousin is suited to the heat and humidity of southern summers. Early to mid-spring flowering and attracts spring butterflies.In the garden, the Aromi Deciduous Azalea Hybrids have the look, feel, and fragrance of many of, or are improvements upon, our most beautiful, US native deciduous azaleas, sometimes called bush honeysuckles, and yet are easy and vigorous enough for the average gardener to be successful with. Item# 10439. Dancing Rabbit produces deep yellow buds that open to bright yellow azalea blossoms with a deep yellow blotch that sit in full, rounded clusters and absolutely cover up this plant in spring! Exceptionally vigorous as well. A gorgeous spring show, fragrant, and it attracts butterflies and other spring pollinators. In the garden, the Aromi Deciduous Azalea Hybrids have the look, feel, and fragrance of many of, or are improvements upon, our most beautiful, US native deciduous azaleas, sometimes called bush honeysuckles, and yet are easy and vigorous enough for the average gardener to be successful with. Item# 10719. Great Balls of Fire is right! Medium to large clusters of large, fiery orange, fragrant azalea blossoms produce a wonderful effect and whose colors are sure to warm up the spring garden. Maarten van der Giessen says this one is of questionable origins and may not be a true Aromi hybrid but could be a Rhododendron flammeum selection, either way it seems to be a good performer and was selected with the rest of the Aromi hybrids from John Allen Smith's Gardens. Early to mid-spring flowering and sure to attract pollinators. In the garden, the Aromi Deciduous Azalea Hybrids have the look, feel, and fragrance of many of, or are improvements upon, our most beautiful, US native deciduous azaleas, sometimes called Bush Honeysuckles, and yet are easy and vigorous enough for the average gardener to be successful with. Item# 10440. The largest of the Aromi's says Maarten van der Giessen! Deep pink buds open to 2-1/2" wide clear pink flowers with a golden blotch that sit in neat rounded clusters atop bare stems. Not your typical pink deciduous azalea, a standout like the wonderful lady it was named after. A gorgeous spring show, fragrant, and it attracts butterflies and other spring pollinators. In the garden, the Aromi Deciduous Azalea Hybrids have the look, feel, and fragrance of many of, or are improvements upon, our most beautiful, US native deciduous azaleas, sometimes called Bush Honeysuckles, and yet are easy and vigorous enough for the average gardener to be successful with. Item# 10720. Wow! Red Pepper is another heat tolerant Aromi deciduous azalea hybrid that has definitely earned a spot in our garden! No wonder it was the 2008 American Rhododendron Society's Rhododendron of the Year! The glowing, rich red-orange azalea blossoms sit in neat rounded clusters atop bare stems. A gorgeous spring show, fragrant, and it attracts butterflies and other spring pollinators. In the garden, the Aromi Deciduous Azalea Hybrids have the look, feel, and fragrance of many of, or are improvements upon, our most beautiful, US native deciduous azaleas, sometimes called Bush Honeysuckles, and yet are easy and vigorous enough for the average gardener to be successful with. Item# 10441. 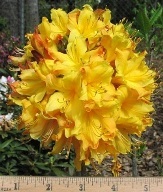 Bright yellow flowers that are flushed with red and with a golden blotch that gives an overall soft orange appearance. The flowers all sit in neat rounded clusters atop bare stems. The Southern Sunset Deciduous Azalea produces a gorgeous and fragrant spring show and it attracts butterflies and other spring pollinators. 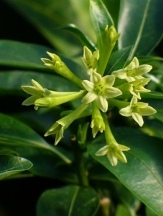 In the garden, the Aromi Deciduous Azalea Hybrids have the look, feel, and fragrance of many of, or are improvements upon, our most beautiful, US native deciduous azaleas, sometimes called Bush Honeysuckles, and yet are easy and vigorous enough for the average gardener to be successful with. Item# 10721. "Even better than Aromi Sunrise" and "Spectacular" says Maarten van der Giessen! Deep red, orange, and yellow buds open to huge, deep yellow azalea blossoms that sit in neat rounded clusters atop bare stems. A gorgeous spring show, fragrant, and it attracts butterflies and other spring pollinators. In the garden, the Aromi Deciduous Azalea Hybrids have the look, feel, and fragrance of many of, or are improvements upon, our most beautiful, US native deciduous azaleas, sometimes called Bush Honeysuckles, and yet are easy and vigorous enough for the average gardener to be successful with. Item# 10707. 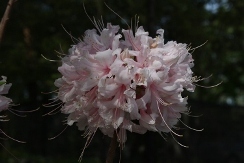 Large, full, rounded clusters of soft pink, fragrant flowers are borne in late spring on this deciduous hybrid azalea. Spring Sensation was bred and selected for heat and humidity tolerance for southern gardens by Dr. Eugene Aromi of Mobile, Alabama as well as for its ability to load up with exceptionally large flower clusters.In the garden, Aromi Hybrid Deciduous Azaleas have the look, feel, and fragrance of many of our US native deciduous azaleas, sometimes called Bush Honeysuckles, and yet are easy enough for the average gardener to be successful with.Item# 10150.